The company formed part of 12th Mechanized Brigade in Helmand province, Afghanistan, on Operation HERRICK 16. Corunna Company was the Armoured Infantry Company (with Warrior armoured vehicles) working as part of the King’s Royal Hussars Battle Group. It has been an extremely tough tour. Be assured that we will remember those who have fallen, but today this is about those who return. All of you should be extremely proud of what you have achieved,” he added before exhorting the gathered relatives to look after his men and women when they got home. During the tour the company lost six soldiers in an explosion. Sergeant Nigel Coupe, from 1st Battalion The Duke of Lancaster’s Regiment, and Corporal Jake Hartley, Private Anthony Frampton, Private Christopher Kershaw, Private Daniel Wade and Private Daniel Wilford, all from 3 YORKS, were killed when their Warrior armoured vehicle was struck by an improvised explosive device in the Lashkar Gah Durai region on Tuesday 6 March 2012. Obviously the whole company feel fantastic to be home and we’ve had a great welcome from everybody today. The six heroes who we lost have been in our thoughts and prayers for the last six months. Our thoughts go out to their families and loved ones. It must be very difficult seeing us come home and their sons and dearest not. For us, this is a joyful occasion, but for them it is not. 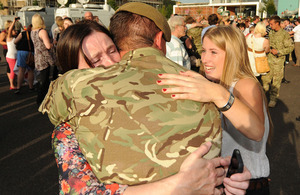 The soldiers of Corunna Company are the first from 3 YORKS to have returned from Operation HERRICK 16. 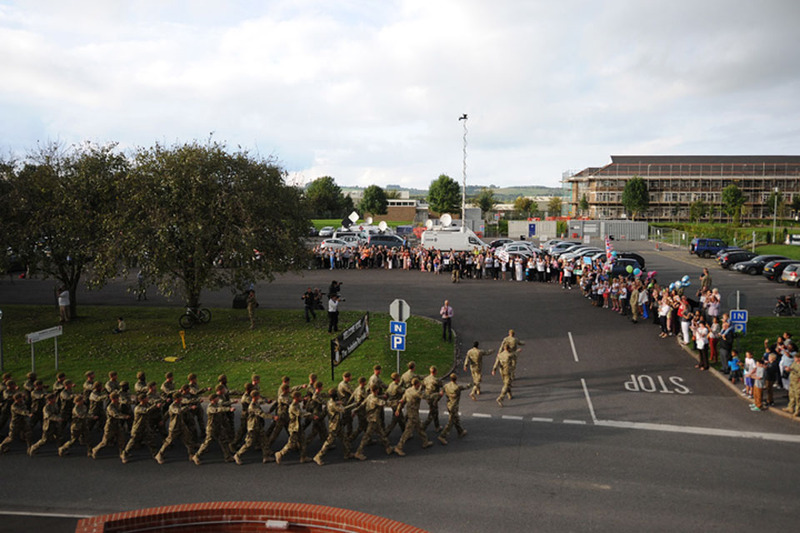 The regiment’s main body of between 350 and 400 soldiers is due back in Wiltshire in late October, and this will be followed by a freedom parade through Warminster in late November.